If you are planning to travel to Safed, one of the locations that you will definitely want to visit is the Hameiri House. This historical museum takes you through the history of the community of Safed over the past 200 years and gives a great overview of the struggles, accomplishments and founders of Safed. The Hameiri House was founded by Yehezkel Hameiri who lived from 1934-1989 and was a fifth generation native of Safed. He spent thirty years restoring the building where the museum is housed and he worked to create a museum that would tell the story of this important city as part of Israel's history. The museum tells a different story about Safed life on each floor. The rooms at street level are said to be more than 400 years old. There is a 16th century mikveh next to the living quarters which used rainwater, as is traditionally necessary for a mikveh. On this level there is also a synagogue that served the Persian community and that was originally built by Hameiri's family. It is partially restored and serves to commemorate its founders. There are two large vaulted halls at the heart of the museum. They are 150 years old and were part of Safed's rabbinical court. This location actually was home to hundreds of orphaned children during the First World War. 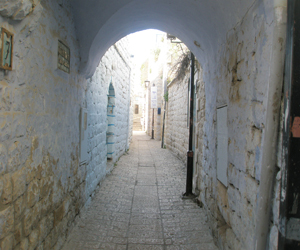 Today, this area has paintings that tell the story of some of the more recent generations of Safed and of the elders of Safed who made up its history. The top levels of the museum show more of the images from the Safed elders, and also contain utensils, implements and craftsmen's tools. During the restoration of the building, a top level was found, leading to what used to be a schoolyard. Over 100 years ago, this was a school for Jewish children during the Baron Rothschild's days. During World War I, the school closed because of both hunger and disease. Later, some local families lived in this space, and the balcony that overlooks much of Safed became a strategic outpost overlooking the Arab quarter. The fighters in the War of Independence in 1948 used this important balcony as a military base. The museum helps visitors to truly understand what life was like in Safed throughout the last two centuries. There is a room called the Reconstructed Room which shows what a typical Safed home would have looked like at the turn of the century. There is a section called the Religious Life of Safed that features ritual objects used by many generations of Safed families. Finally, there is a section that pays tribute to the heroes of Safed and is called the Heroic Safed. This features documents and items from the struggle for Safed's survival up until Safed's liberation in 1948. The actual room that houses these artifacts was used as a forward position during the War of Independence. The windows there were sealed and firing slots were cut into the walls to defend the fighters against the Arab invasion. The museum is certainly an important piece of Safed history. The building helps visitors to explore Safed's rich history, and the items in the building are also significant and interesting. It is a crucial piece of Safed history and one that should be explored by visitors who come to this historic city.